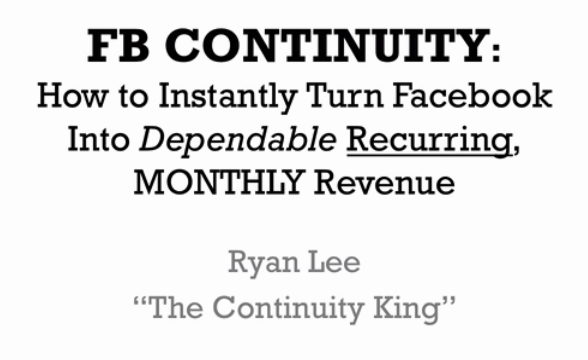 Hi, it’s Ryan Lee and you might know me as the “Continuity King”. Since creating my first continuity program in 2001 – I’ve gone on to create hundreds of these programs and generate over 7-figures per month. Did you want to create continuity income and don’t know where to begin? Confused with all the software. And plugins. And not sure how to get people to stick around? Well, I have great news for you. After a 12 month journey for the “perfect” continuity program – there is a solution. It’s “Facebook Continuity”. Using Facebook to deliver your continuity program eliminates vritually ever “barrier”. You don’t need software. Or plugins. In fact, you don’t have to even manage usernames and passwords. But the biggest benefit, by far, is the retention. People BUY for CONTENT – But they STAY for COMMUNITY. And in my 13+ years of creating hundreds of continuity programs, I’ve never seen better community bulding than in a FB continuity program. The retention rates have been DOUBLE. After all, there’s no point in creating a continuity program if people don’t stick around for more than one month. This is going to be a $1,500.00 training program. But right now, I’m taking a test-group through the system. I’m talking STEP-BY-STEP… all delivered LIVE (all trainings are recorded for lifetime access). You can become a member of this special test-group for just one-payment of $197. There are no upsells, just a clean offer. The numbers are very compelling. Even if you had just 50 members at $47 per month – that’s almost $2,500.00 PER MONTH in recurring revenue (one of my FB Continuity programs has over 1,000 members paying $47 per month).